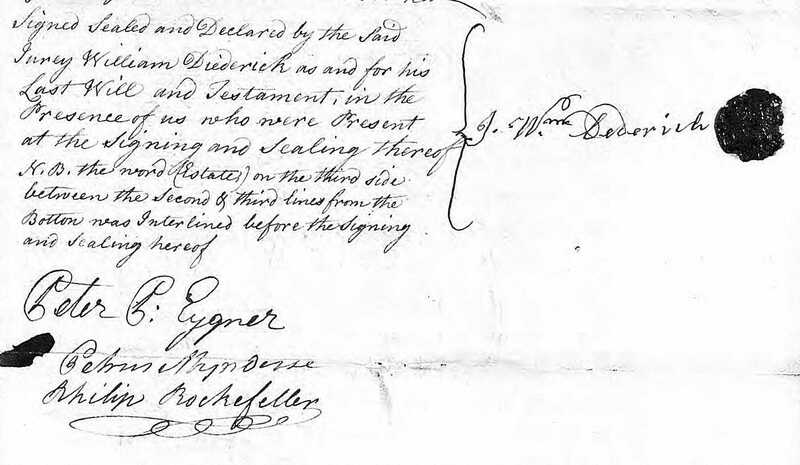 Among the many Palatine Germans in my family tree was a man named Jury William Dederich (1711-1786). He lived in Ulster County, NY, in a Palatine settlement called West Camp, located in the Hudson River Valley. Through ancestry.com, I recently found a copy of his will written in 1786. In it, he left to his heirs worldly goods such as “lawful money of the state of New York” (NY was still using its own currency in 1786), one enslaved man named Jack, and a number of tracts of land in the West Camp and Saugerties areas of NY State. The will was signed and sealed in the presence of three witnesses. One name that caught my eye was that of a Philip Rockefeller. I vaguely knew that the Rockefellers were Palatine German immigrants, but didn’t know much of their story. There were apparently two Palatine progenitors of the American Rockefellers. Their descendants formed the dynasty of industrialists, politicians and philanthropists that includes John D. and Nelson Rockefeller. Johann Peter Rockefeller was a miller who settled in New Jersey about 1723. Johann Peter’s cousin Diell Rockefeller was a farmer who immigrated to the Germantown area of Columbia County, NY State about 1740. When a granddaughter of Diell married one of Johann Peter’s grandsons, the line that led to Standard Oil founder John D. Rockefeller began. Philip Rockefeller was one of Diell’s sons, born in 1746 in Germantown NY. He seems to have possessed the family genes for business and politics. In addition to owning a store and a river landing, he was a local representative at the first Colonial Congress in 1775. After serving in the revolutionary war in NY’s Manor of Livingston Regiment, he later held positions as town justice, supervisor, and clerk. New York Currency, A Project of the Robert H. Gore, Jr. Numismatic Endowment University of Notre Dame Department of Special Collections, by Louis Jordan, 1999. The Transactions of the Rockefeller Family Association, by Benjamin Franklin Rockefeller and Claudius Rockefeller, 1915. Titan: The Life of John D. Rockefeller Sr. by Ron Chernow, 1998.